Workplace injuries can quickly complicate your life. The unexpected financial, physical and emotional challenges that a workplace injury brings not only affect you, but your entire family. If you have suffered an on-the-job injury, take initiative and speak to an experienced workers’ compensation lawyer to learn about your rights. At Atkinson Law Office, P.A. & Minnesota Disability, we will stand up for your rights and assist you with all aspects of your injury. From our offices in St. Paul, Minnesota, we represent people throughout the Twin Cities and the entire state of Minnesota in workers’ comp claims. Our practice is dedicated to workers’ compensation matters. 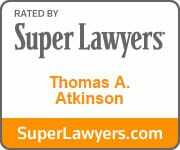 Attorney Tom Atkinson is a Workers’ Compensation expert with more than 25 years experience handling cases across Minnesota. Our legal staff takes a proactive and personalized approach to working with our clients. We understand that you will be facing significant challenges and that no two injuries are the same. We will listen to what you have to say and ensure that our priorities are directly aligned with your goals for your claim. Our firm takes a caring, compassionate and assertive approach to advocating for clients. Experience is key when it comes to achieving a successful outcome for a workers’ comp claim. Prior to opening his own practice, attorney Tom Atkinson represented large insurance companies in injury claims throughout Minnesota. He understands the tactics, tricks and strategies that the insurance companies will use in trying to get you to settle your claim. Moreover, Tom Atkinson has been in your shoes. He has personally suffered a workplace injury and had to sue to obtain benefits. He has first-hand knowledge of the struggles injured workers face. Few lawyers in the area can say they have the same level of legal experience, knowledge of the insurance companies and personal understanding of the battles injury victims face as Mr. Atkinson. If you have suffered an on the job injury, don’t wait, contact a lawyer immediately to learn about your rights. Our attorneys will talk with you about your injury and help you determine what benefits are available to you. We handle cases involving knee injuries, back injuries, head injuries, depression, repetitive stress injuries and more. We want to talk with you and hear about your situation. We have helped workers in many different industries including construction, retail, hospitals, schools, offices, and state buildings. Know your options and be informed. We look forward to hearing from you. Our highly experienced lawyers and team of professionals work together to provide our clients with superior representation aimed at obtaining the full and fair results our clients deserve. We focus on workers’ compensation and disability claims. Because we are not part-time players, you receive the benefit our thorough knowledge of the law and claims process. We listen to our clients from day-one, and provide straightforward advice. You will have one point of contact throughout the process to ensure that your concerns are addressed promptly. We champion the best interests of each client. Our lawyers are not afraid to go to court, when necessary, to obtain full and fair benefits our clients deserve. We do not back down. "I just want to say a big ‘thank you’ for representing me in my Social Security case. Without your help, I "know that I would not have been successful"
Atkinson Law Office is located in Saint Paul, MN and serves clients in and around Circle Pines, Minneapolis, Saint Paul, Anoka County and Ramsey County.